If you possess a cat, probably you might think to buy a bed for them. These days cat beds comes in a variety of colours, shape, sizes and styles and is unlimited to budget and taste. Since cats usually spend around 15 hours a day sleeping, it is a must for every cat holder to purchase a well used bed for their pets. After dog, cats are the most popular pets that people likes to have. As compared to dogs, cats are seemed to be more delicate creature and so they need for care. In case you have a cat or are planning to have one in near future you need to arrange a suitable bed for cats at any cost. Cats do often sleep on your beds or other furniture leaving behind lots of cat hair. This is why in order to sort out things for your cause you need to have a cat bed to make everything handy. You need to evaluate the sleeping habits of your cats by observing things before you buy cat beds. You must observe whether your cat stretch or curl. When it comes to cuddle, they do it under blankets, clothing or some box or sack. In case your cat is suffering from some ailment and need extra supports, you can meet to find all their needs right at the corner online store. Cats that curl up while sleeping are comfortable in round beds and they require a bed that can vary between 2” – 4”. In case your cat sleeps with her head propped up, you need to buy cat beds with sides and bolsters. 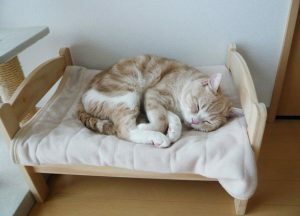 For cats that like to stretch out, their bed must be with rectangular shape with nice pillow in the form of platform. These beds can be availed fro, fluffy or foam fibre and might have removable covers for easy cleaning. If your cat loves to sleep with you, having a throw might be well suited. These act as great furniture cover and also help you get rid of unwanted hair from furniture. You can also find some heating elements to keep your pet comfortable. However, if your cat likes the outdoors a lot, you can buy cat beds specially designed for outdoor purpose. But before you buy such beds, you need to ensure that you have a place to keep it away from weather elements. For keeping your cat cozy and comfortable, you can buy a heating element to make sure your cat stays warmer even in winter seasons. Wicker baskets– These are the traditional and cheap type baskets but it can easily be chewed by your cat making it difficult to wash. Plastic baskets- The shape is similar to wicker baskets, however it is lined with cushions or soft blankets. Donut cat beds– These are made from stuffed and soft material with a soft lining slightly in the higher sides. Cat hammocks/radiator beds– These beds are made from wool and hungs over radiators. One advantage over using this is that they render a perch for your cat to watch the world go by. Enclosed cat/ igloo beds– These are usually made from fabric with stuffed lining that offer privacy, warmth and security to your cat. Size- It should be large enough for cats to stand and turn around in and also be snug enough to make them feel secure. Warmth- Size should be high enough to keep your cat warm and if you can prefer enclosed beds it will be better otherwise if open, it can be placed close to a heater. Ability to wash clean- If you decide on a fabric cat bed, you can look for one that can be easily washable and does not need cleaning frequently to remove fur, and dirt in the event of disease outbreak. Comfort- Opt for a bed that has adequate filling that is plastic in style and lined with soft blankets. Online shops and pet shops are the best place to buy cat beds. Where should the cat bed be placed? Beds should be placed out of high traffic area however within the view of family members. So, keep them in a quite part of the lounge room or even by a window side. In case you’re having more than one cat, you can have one bed per cat although they can closely prefer to sleep together. After you have read and studied all the important information given about cat beds, you can now plan out to search them through online store and local stores. Keep in mind the interest and emotional parameters attached with your cats and you’ll do fine in finding the best one. Avail the purchase offer at the right time and seek for professional and expert advice when you need. This will resolve your doubts regarding the choosing your favourite bed for your lovely cat.